DeepButi on the hunt for caches. DeepButi가 지오캐시를 찾기위해 등정에 나섭니다. The geocacher who found the oldest unfound geocache in Europe on a thin ridge line of one of Europe’s most imposing mountains, doesn’t even like climbing. In fact, DeepButi doesn’t like caves either, but when the prize at the end of the adventure is a First to Find (FTF) after 12 years, 1 month, and 3 days…well, there’s no stopping him then. 유럽에서 가장 인상적인 산들중의 하나의 산속에 있는 좁은 산등성이에서 오랜동안 미발견된 캐시를 찾아낸 등산을 그리 좋아하지 않는 지오캐셔가 있습니다. 실제로 DeepButi는 동굴도 좋아하지 않습니다. 그러나 모험의 끝에는 12년 1개월 하고도 3일 만에 발견한 지오캐시의 FTF로 보상됩니다....아무도 그를 멈출수는 없습니다. The Traditional Geocache, 'Puppet Theatre stash on the Mont Blanc' (GC89FF) sat undisturbed among frigid slabs of rock and shifting snowdrifts for years. Several intrepid geocachers had attempted the search—and some came very close—but none had laid eyes on the geocache itself. 트레디셔널 캐시인 'Puppet Theatre stash on the Mont Blanc' (GC89FF) 은 차가운 바위틈에서 그리고 이리저리 날리는 눈보라속에서 몇년동안 홀로 놓여 있었습니다. 몇몇 용기 있는 지오캐셔들이 도전을 했지만 - 그리고 어떤이는 거의 지오캐시 근처까지 갔지만 - 아무도 이 지오캐시를 만난 사람은 없었습니다. DeepButi says,"One day, I found myself wondering why what seems like a reasonably accessible cache had not been found for almost eleven years." "하루는, 어떤 이유로 11년동안 무리없이 발견할수 있을것 같은 캐시가 발견되지 못했는지에 대해 궁금해 하는 내 자신을 발견했습니다." 라고 DeepButi는 말합니다. That’s right—"Puppet Theatre stash on the Mont Blanc" (GC89FF) was hidden on Mont Blanc by an Estonian team of geocachers (Tarmo Männard, Kaido Pähn, Üllar Rosenfeldt, Anu Audse ja Vilja Heinmets) on July 2nd, 2002. 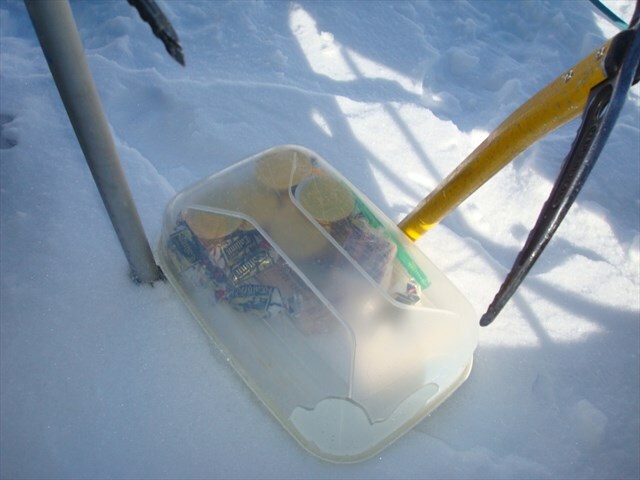 At 4074 meters (13,400ft) above sea level, the contents of the geocache were well protected. They included 9 chocolate medallions, 14 candies, 3 bags of Lipton tea, 3 boxes of matches, 10 whole-family tickets to the Estonian Puppet Theatre, a paper and a pen, and a geocaching letter in Estonian and in English. 바로 그렇습니다. - "Puppet Theatre stash on the Mont Blanc" (GC89FF)은 에스토니아 지오캐셔들(Tarmo Männard, Kaido Pähn, Üllar Rosenfeldt, Anu Audse ja Vilja Heinmets)에 의해서 2002년 7월2일에 몽블랑에 숨겨졌습니다. 해발 4074미터(13400피트)에 위치해 있으며, 지오캐시 내용물은 잘 보관되어 있었습니다. 그들은 9개의 메달모양 초코렛과 14개의 사탕, 3개의 립톤 티백, 3상자의 성냥, 10장의 Estonian Puppet Theatre의 가족 동반 입장권, 펜과 종이, 그리고 에스토니아어와 영어로 쓰여진 편지를 같이 숨겼습니다. This is the story of DeepButi's FTF. 이 이야기는 DeepButi의 FTF 도전기입니다. 지오캐시는 이곳 어딘가 숨겨져 있습니다. He says, "I love mountains. Hiking for hours just for the sake of it, probably getting a fantastic reward at the peak with astonishing 360º views. And then there was THAT geocache, a normal one I didn’t need any special tools for." 그는 "저는 산을 사랑합니다. 1시간 정도의 하이킹은 아마도 정상에서의 놀라운 360도 전경과, 그리고 바로 그곳에는 별도의 도구없이도 열수있는 평범한 컨테이너로 숨겨진 그 지오캐시를 발견하는 것으로 우리는 보상을 받습니다." 라고 얘기합니다. "And one day, I found myself wondering why what seems a reasonably accessible cache had never been found for almost eleven years. After having "Puppet Theater stash on the Mont Blanc" on my watchlist for years just as a curiosity, a find in Canada switched something in my mind. If "4.5lb Walleye" was already found, why not give GC89FF, oldest unfound in Europe, a chance? So I did." "그러던 어느날, 어떤 이유로 11년동안 무리없이 발견할수 있을것 같은 캐시가 발견되지 못했는지에 대해 궁금해 하는 내 자신을 발견했습니다. 그 이후로 "Puppet Theater stash on the Mont Blanc"는 저의 호기심으로 인해 몇년동안 와치리스트에 올려져 있었고, 캐나다에서 내 마음을 바꿔줄 무언가를 찾아보았습니다. 하지만 "4.5lb Walleye"는 이미 누군가 FTF를 해서 유럽에서 오랜기간 미발견된 지오캐시를 찾을 기회라고 생각했습니다. 그리고 저는 계획을 실행에 옮겼습니다." "It was not going to be a simple cache hunt, nor a long hike or a complex cache hunt. From the very first minute, the planning and logistics made the 'it's the journey' concept the key element of the whole adventure." "이것은 단순한 캐시 헌팅이 아닙니다. 그렇다고해서 긴 하이킹이 필요하거나 복잡한 캐시 헌팅 또한 아닙니다. 맨 처음에는 큰틀과 세부계획으로 모든 모험의 키가 될 요소인 '여정'라는 컨셉을 만들었습니다." A little bit of research showed that the team who’d hidden the cache had formed a normal hiking expedition up Mont Blanc. They were not climbing experts carrying special equipment. This reassured DeepButi; with correct planning, the geocache was reasonably accessible, but sometimes the mountain decides whether or not you find a geocache. 약간의 조사를 통해 캐시를 숨긴 팀은 일반적인 하이킹 방법으로 몽블랑을 오르는 원정을 했다고 보여졌습니다. 그들은 전문적인 산악 장비를 가지고 등반하지 않았습니다. 이것으로 DeepButi는 올바른 계획을 세울수 있었고 또한, 지오캐시로의 접근이 원활한것에 안심을 했습니다. 하지만 때때로 산은 지오캐시를 찾을수 있는지 없는지를 결정합니다. DeepButi says, "Three months later, on Sep 2013 I went there. A full five day alpine hiking experience. Some great caches. But weather, and specifically avalanche risk, makes its own decisions. We had to cancel the attempt at the very last minute as the route was not safe. 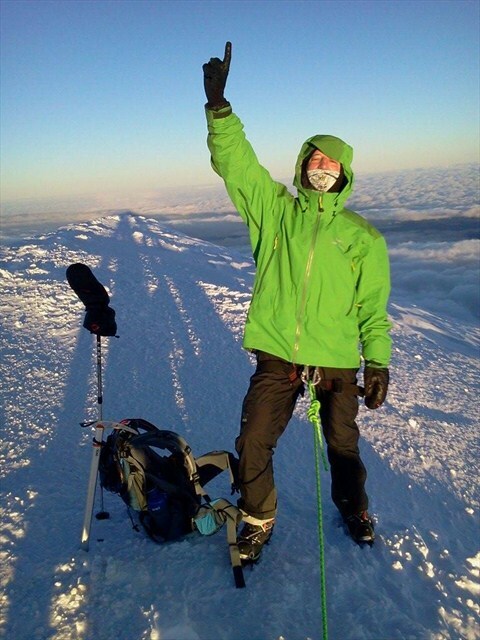 Instead, we summited Mont Blanc…not bad as a substitute." DeepButi는 "3개월 후, 2013년 9월달에 나는 그곳에 갔습니다. 5일내내 고산 하이킹 체험을 했고, 몇개의 멋진 캐시도 발견하였습니다. 그러나, 날씨, 특히 눈사태의 위험은 모든것을 좌지우지합니다. 우리는 등반로의 안전이 확보되지 않아 막판에 지오캐시를 찾는 시도를 포기해야 했습니다. 대신 몽블랑을 등정하였습니다. 그리고 그 결정은 나쁘지 않았다고 생각합니다." 라고 얘기합니다. "Summer 2014 in central and Southern Europe has been, in weather terms, a disaster. Without the normal anticyclonic periods, finding a day for a second attempt was delayed week after week until we decided to try a small window on July 23-25. After a terrific hike from refugio Torino crossing the Vallee Blanche we arrived at Cosmiques, the logical starting point for the hunt, on 24th." "2014년 여름에는 중앙 및 남부 유럽에 이상기후가 있었습니다. 정상적인 고기압 기간이 사라져서, 2번째 시도를 위한 날은 우리가 6월23일-25일에 잠깐의 기회를 틈타 시도를 결정하기 전까지 한주,두주 계속 연기되었습니다. 우리는 refugio Torino에서 Vallee Blanche를 횡단하는 격렬한 하이킹 끝에 6월24일에 지오캐싱을 위한 최적의 출발지점인 Cosmiques에 도착했습니다." 날씨가 지오캐시를 찾는것을 연기시키고 있습니다. "The noise of small avalanches surprised us at the East side of Maudit-Tacul creating some incredible moments I will keep forever. But it was not our day. The guard at Cosmiques told us of a recent avalanche and more expected. No way to go up for several days. At 4,000m high you don’t play with this kind of advice and I returned home in quite a bad mood." 작은 눈사태의 소리에 우리는 놀랐습니다. Maudit-Tacul동쪽 사면은 믿을수 없는 순간을 만들어 내고 있었습니다. 나는 그것을 평생 기억하게 될것입니다. 그러나 그날은 우리의 날이 아니였습니다. Cosmiques의 관리자가 최근 눈사태에 대해 이야기 해주었고 점점 심해질거라고 얘기해 주었습니다. 하릴없는 몇일이 흘렀습니다. 4000m높이에서 당신은 어떠한 조언도 해줄수 없습니다. 그리고 나는 우울한 마음으로 숙소로 돌아가야 했습니다." Finally, a window of good weather opened up a week in August, and DeepButi knew it had to be then. He arrived at Cosmiques with his guide, Fabio Levi, and the forecast was perfect. 마침내 9월달에 들어 처음으로 좋은 날씨로 한주를 시작했습니다. 그리고 DeepButi는 실행에 옮겨야 할때가 왔다는것을 알았습니다. 그는 가이드인 Fabio Levi와 함께 Cosmiques에 도착했고 기상조건은 완벽했습니다. He says, "And there we went. At 6:15am we started a hard hike up Mont Tacul. You need to be there to know what it is like, every meter of its iced slopes deserves the T5 [Terrain 5] rating." 그는 "그곳에 도착한후 우리는 새벽6시15분경에 Mont Tacul를 힘겹게 오르기 시작했습니다. 당신은 그곳이 얼음으로 된 경사면을 오르는 매순간마다 지형난이도 5레벨을 받을만한 지형이라는 것을 알아야 합니다. "라고 얘기합니다. "It took us almost three hours to move the GPS distance [from the geocache coordinates] from 1,600m to 500m…at that distance only a soft slope down remained and the objective was pretty clear: a group of rocks at the East edge of Col Maudit. An incredible vision. All my efforts at sight for the first time. White snow and black rocks. I love it." "우리는 GPS거리[지오캐시 좌표로 부터의 거리]로 1600m에서 500m로 줄때까지 거의 3시간을 이동했습니다. 그곳에서 부터는 단지 완만한 내리막이 남아있었고 Col Maudit동측면에 있는 한무리의 바위들이 꽤 선명하게 보였습니다. 믿을수 없는 광경이였습니다. 처음 내 시야에 들어온것은 하얀눈과 검은암석들이였습니다. 나는 그 광경을 좋아합니다." "Once there, laminated photos of the cache location proved to be helpful. They allowed us to confirm the GPS arrow and directed us to the northern group of rocks. Fabio crossed the last aerial meters and found exactly what was on the images. He said, 'I have something. A broken plastic box.'" "그곳에 도착했을때, 캐시위치가 나타난 얇은 사진 한장이 캐시위치을 파악하는데 도움이 되었습니다. 그 사진은 우리들에게 GPS화살표 방향을 확신하게 하였고, 북쪽 바위무리로 향하는것을 가능하게 했습니다. Fabio는 마지막 능선을 건너갔고, 사진과 똑같은 장소를 발견했습니다. 그리고, 그는 '깨진 플라스틱 상자를 발견했어'라고 말했습니다." Fabio, one second after making history: Found! Fabio는 잠시후 역사를 만들어 냅니다. : Found! "The best words I could imagine. I knew at once that “broken plastic box” could only mean one thing: the original box! Aha! Nobody was there to see two adults shouting and jumping like children at 4,000m meters high. It was an incredible end to a 14-month obsession, full of hope, despair, deception, and positive energy." "제가 듣고 싶었던 바로 그 단어였습니다. 나는 단 한가지 만을 의미하는 "깨진 플라스틱 상자"가 무엇인지 즉시 알수 있었습니다. 지오캐시가 틀림없다! 그곳은 다 큰 어른 두명이 해발 4000m고도에서 어린아이처럼 소리치며 깡총깡총 뛰는 모습을 보아줄 사람은 아무도 없는 그런 곳이였습니다. 강박 관념, 가득찬 희망, 절망, 기만, 그리고 긍정적인 에너지로 점철된 14개월만의 극적인 결말이였습니다." "Honestly speaking, the cache itself is not that difficult a find—a 7 hour hike is nothing special and the final spot is quite accessible. But you must plan to go there as only a geocacher can do, with a specific goal on your mind. And you have to convince yourself that, after 12 years there was no single reason to suspect it would not be there. And yes it was." "솔직히 말하자면, 캐시 그자체는 그것을 찾기위해 7시간동안 하이킹을 하는 어려움외에는 특별할것이 없었고, 마지막 구간은 꽤 접근하기 쉬웠습니다. 하지만 당신이 지오캐셔만이 갈수 있는 그곳에 가기 위해서는 반드시 당신의 마음에 특별한 목적을 함께 계획해야 합니다. 그리고 당신자신을 12년의 시간동안 캐시가 없어졌을거라고 단 한점의 의심도 하지않게 납득시켜야 합니다. 그리고 캐시는 그곳에 있었습니다." "So, we did it. Because we knew we could do it." "그렇습니다. 우리는 해냈습니다. 우리는 해낼것을 믿고 있었습니다." The NUKU Puppet Theatre confirmed the tickets are still valid and will be forever. One of the original geocache-placers still works there, and DeepButi is already planning his trip. Another one of the geocache owners is going to bring DeepButi some “fresh” candies the next time he visits Spain. The NUKU Puppet Theatre는 이 입장권이 여전히 유효하며 앞으로도 유효할것이라고 승인해 주었습니다. 이 캐시를 설치한 사람중 한명이 여전히 이 극장에서 근무하고 있으며, DeepButi는 이미 그와 함께할 여행을 계획중입니다. 또 다른 지오캐시 오너는 다음번 DeepButi가 스페인을 방문하면 몇몇 '신선한' 사탕들(지오캐시)으로 그를 데려갈 예정입니다. DeepButi was also FTF on the long unfound cache in Spain, and has some of the highest peaks under his belt. His next adventure? 또한 DeepButi는 스페인에 있는 높은 봉우리의 허리쯤에 있는 스페인에서 가장 오랜기간동안 미발견된 캐시를 FTF하였습니다. 그의 다음 모험의 대상은 무었일까요? He says, "I'm already thinking on my next "incredible one"…but it will have to wait sometime." 그는 "저는 이미 "엄청난 캐시"를 찾아 나서기 위해 구상중입니다만, 다소 얼마간 준비기간이 필요합니다. "라고 얘기합니다.